The daily routine in Norman can be monotonous. And when it gets to a point that you need an escape from the ordinary, the 2017 Ford Escape is ready to help. With powerful engines, four-wheel drive capability, and plenty of cargo space, the Escape is the perfect SUV for a weekend getaway or open ended adventure. 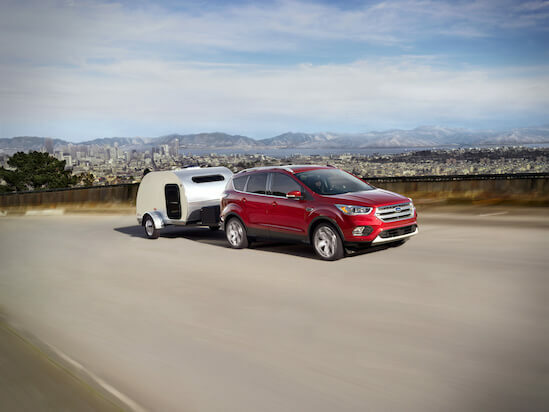 Thanks to three impressive engine options, the Escape powers up to 245 horsepower and 275 pound-feet of torque, and efficiently drives up to 30 mpg highway. That power translates to a 3,500 pound max towing capacity, allowing you to bring your extra gear along for the journey. Throw the Intelligent 4WD System into the mix, which constantly monitors traction and road conditions and automatically adjusts power and torque to ensure optimum handling, and the Escape is capable enough for anything Mother Nature throws at the road. And of course, on any escape, you need room for cargo. The Escape has you covered there, too. With 34 cubic feet of cargo space already behind the second row seat, that space can boost up to 68 cubic feet when the 60/40 split rear seats are folded. Roof rack side rails are also available for even more cargo options. Make your escape by browsing the new Ford inventory available at Reynolds Ford of Norman. Come in to test drive the Ford Escape today!